In 2004 the Firebird Festival was born. We were a group of people exploring ways to cultivate the art in Phoenixville, called The Arts and Entertainment committee – Lynn Miller, Charles Segal, Lisa Muller, Mary Foote, Kathy Bestwick and I. We created several of the murals we have in town. Lynn Miller came up with the idea of the festival, and we all took on different aspects of the festival. Lisa Muller organized the craft vendors with big support from her husband Paul … and made clay bird workshops at the Phoenix Village Art Center. Lynn Miller organized the entertainment. Mary Foote did fund raising and balancing the books. Charles did our website, creating T-shirts and other firebird items, and organized the Firebird Booth. I organized the volunteers and was responsible for the building space, and festivities grounds. 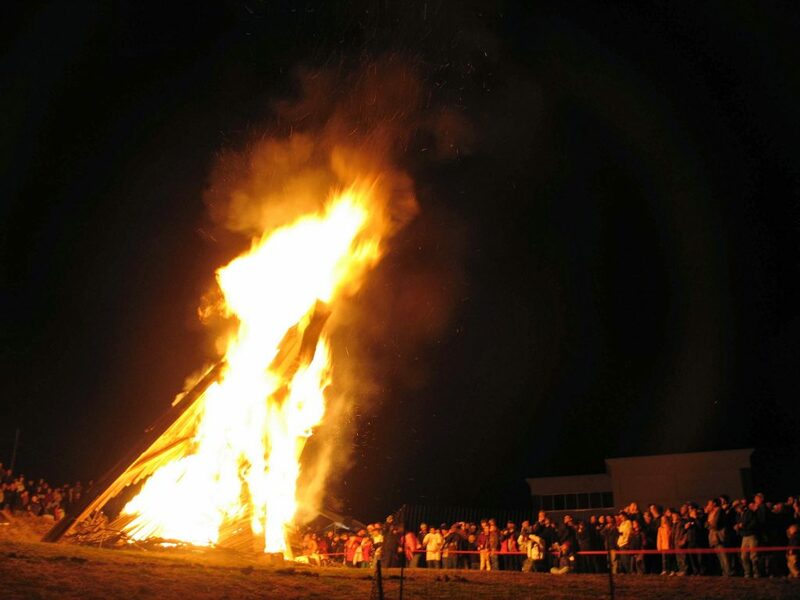 We also involved Mia Bosna, which had these annual extravaganza parties, with music and a big bonfire. She took on our procession with her phenomenal drummers and Bill Minazik, the pyromaniac extraordinaire at her parties, took on building the Phoenix. In all he was the creator of 5 of our sculptures. Charles Segal made 3, Brett Williams, that later got involved made 2 Phoenixes, and I with this year’s model 4. In 2004 and 5 we build our Phoenixes on the Phoenix Property Group (PPG) land owned by Walt Logan (now Manny Demutis’ Phoenix Village Apartments). In 2006 we moved to Manny’s property ( now the parking lot area of Borough Hall) to make way for promising plans of a 3 stories 900 car garage building. It was a great spot, but tight to squeeze all the people in. The very uneven hill was packed with people in total darkness. Everybody helped each other out, so nobody got hurt, and that speaks a lot of the good spirit of the community. In 2012 we moved back to our first location, now owned by Manny DeMutis, because of the building of our new Borough Hall. Being in the downtown area was beneficial for the businesses, the best sales day of the year. We put musicians where ever possible, and our downtown was buzzing with colorful life. In 2013 we had to move to the North side, to Friendship Field. It was nice to have all the space, yet we missed the daily exposure of people driving by the construction site, and downtown suffered with less people. 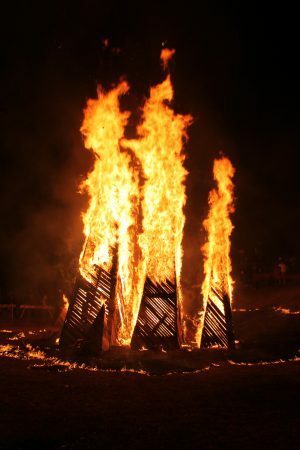 In 2014 still in Friendship field some teenagers lit the Phoenix on fire just before the festival. Reflecting on it, we had all the ingredients for a great festival, and we needed to keep the clay birds burning, so we put a request out on Facebook for people to bring pallets. The response was overwhelming. Soon we had so many pallets, that we didn’t know what to do with, so we decided to build a new Phoenix. In 3 ½ hour we had a pretty cool bird. All of this happened is pouring down rain. The pallets had to be dropped off at the road side, and carried to the site. The heavy human traffic muddied up the field, so a call was made to Colonial Gardens, and they donated us lots of straw bales, which were spread out in the field. Giant and Acme donated us donuts, Coffee and other food items. What was left over afterward got donated to PACS, our local food donation program. It was impressive how the whole town came together, to reclaim what the Grinch took from us. It became something much more than we could have planned. After 2011 our group decided to quit, only I wanted to continue, so I did. Charles stayed on for a couple of more years as valuable background support. As a blessing, it has forced me to reach more out. We have many good organizations in Phoenixville, and new ideas keep developing with them. Last year the High school made Phoenix models, and the Senior Center created firebird wands. Neil Phelan from Karate studio usually joins the procession with a Firebird float. Another float is also in the making. The Festival has non-profit status, and used to be under the wings of the Phoenix Village Art Center, when they got replaced by the Soltane community, the Jaysees have adopted us. We are excited of that collaboration, since they intend to take on much of the practical parts of the festival. They are a strong organization, already supporting many of the festival in town. The mission of the Firebird festival is to support the art and cultural life of Phoenixville, and we want to support collaboration among the different good organization in our town. We are still a mostly white festival, in spite of big Hispanic and Black community, but I trust we with time can get more colors to our palette. Our first year we had about 150 people and it grew over the years to now 20 000 people, changing it from a participatory to a spectator event, yet there is still a tremendous pride of our festival, that gets many involved. The festival allows for multiple creative contributions, which is a goal of ours. We celebrate our human creativity, and what we are capable of. In the middle of September we will start building the Phoenix in the weekends. Lots of people come and help, and it makes the process very rewarding. Please come and join us. In middle of November the Art center will have their clay bird workshops. Around 150 clay birds will be put into the big Phoenix, and Sunday Morning, after feeding the fire overnight, we will retrieve the small treasures. A wonderful part of the festival, that most people are not aware of. This year (2018) we will be in Veteran field (our town is running out of spaces, where we can have the festival. Friendship field parking lot will go under construction for our new Civic Center), which is more isolated, and that will be a challenge. Over the years we have faced many challenges, and I am convinced we will overcome these, and have a great festival. It will be December 8th.